Liberty hall was comfortably filled last evening, on the occasion of the lecture by Swami Vivekananda, the noted Brahmin monk, who was a prominent personality at the world's parliament of religions at Chicago last summer, and who is spending some time in this country, studying its manners and customs. The lecture was under the auspices of the woman's club, and was a novel and interesting occasion. The noted Hindu was pleasantly introduced by the president of the club, Miss Wetherbee, who alluded to the great antiquity of India, its wonderful history and the high intellectual qualities of the Hindu race. The speaker of the evening was attired in native costume, namely, a bright scarlet robe, confined at the waist by a long scarf of the same color, and wore a picturesque white silk turban wound round his head. At the first glance one saw the swarthy complexion, the dark and dreamy eyes and introspective manner of a high caste Brahmin, whose life is devoted to religion and who is also a celibate. That he is a finely educated person, appeared in his wonderful command of English and his power of argument, while an occasional quotation from Milton and Dickens, showed that he was appreciative of the great English classics. 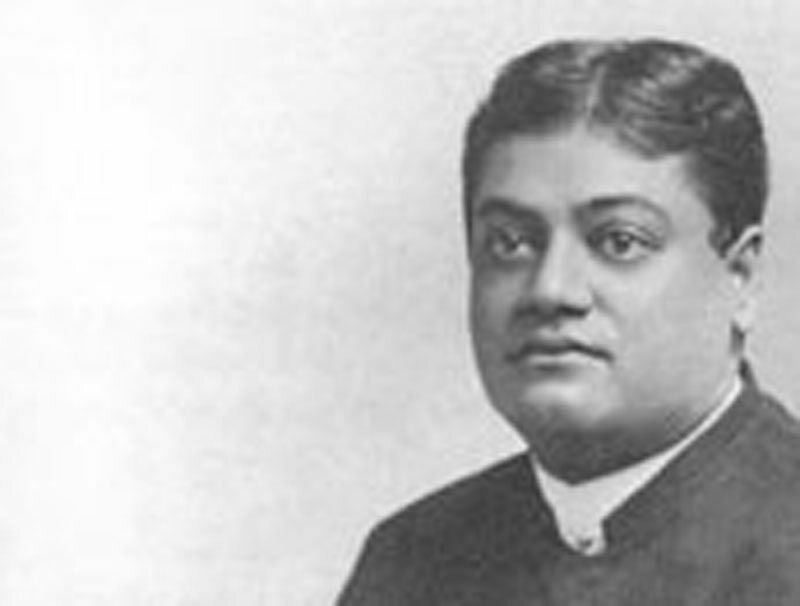 He first spoke of that striking peculiarity of the social condition of the Hindu's caste, affirming that it is not now as strict an institution as in the past, although even now everything goes by heredity. Mixture of castes, though not absolutely forbidden, entails disadvantage on the children. The Brahmin or high caste person devotes the first part of his life to the study of the Vedas or sacred books and the latter part to meditating on the divinity, being supposed to have overcome the human in himself, and to be only a soul. The speaker did not hesitate to criticise adversely some western customs, especially some connected with the position of woman. He affirmed that we worship women in the wife, while all women to the Hindu represent the mother element. In America when a woman ceases to be young and beautiful, she has a hard time of it, but in India kings must step aside for an aged woman to pass, so great is the respect in which they are held. He affirmed that some of the most beautiful portions of the Vedas, the Hindu bible, were written by women, but that there was no other bible in this world in which they had any part. Considerable time was given to refuting the statement, which he characterized as untrue, in regard to the cruelty practised to widows in India, the speaker referring in the course of his remarks to the zenana widows, who have been for some time the objective point of Christian missionaries from other countries. Marriage is an institution very safely guarded and, in addition to the law that a Brahmin must not marry a relative, none are allowed to marry who are known to have such a disease as consumption or any incurable physical ill. The strict rules of caste which prevent a person from drinking from the same glass as another, and other kindred regulations, although [not] part of the religion, were excellent in their result on the physical condition of a country, numbering 285 millions, in the prevention of the spread of contagious diseases. The speaker was horrified, as he might well be, at the promiscuous water drinking seen in railroad trains and stations in this country. The children are, first of all, taught kindness to all living beings and so thoroughly is this training that the smallest child instinctively turns aside from stepping on a worm. A strange thought that among these so called heathen there is no need of the society with the long name which often fails in its mission in Christian lands. * The guest of a house, that is, a man who comes to the door and says, "I am hungry," is God's own image to the Hindu and is treated with the utmost kindness and consideration, being fed before the master and mistress of the establishment. The speaker alluded sadly to the poverty of his country, for, while the upper caste live in comfort, there are millions whose only food is dried flowers, and who are so low in the scale of existence that they have hardly an identity, and are pitiful objects in the plane of existence. He hinted quite forcibly that food and education would be better than the sermons which Christians and Mohammedans had been throwing at them for the last hundred years. Many of the simple and primitive customs of this peculiar people were told with naivete and innocence that was refreshing in this age when words are used to conceal thoughts. He said there was no flirting or coquetting between their young men and maids, and that the latter did not strut forth into public places with all their bravery [finery?] on for the purpose of securing a husband, all of which made the inhabitants of this great and glorious republic wonder if something were not slightly rotten in the state of Denmark. It is well to see both sides of the shield in order to be able to decide with an unprejudiced eye, and many of the listeners went away quite puzzled in mind at hearing some of their pet American customs arraigned by a Hindu and a heathen. The address was a most interesting one and was listened to with deep attention by all present. At the close many [questions] were presented to the thoughtful monk, who wasted very few words in social flourishes or unmeaning talk. He seemed much interested in Dr. Bowker, the only one in the audience who had ever visited the strange land which was centuries old before this republic was born.